The walled city of Sos Del Rey Catolico is located in the northern region of Aragon, and was the birthplace of King Ferdinand II. There are two interesting stories behind this extraordinary town, the first involving the birth of King Ferdinand II. Son of King John II’s second wife, Juana, he was not in line to the throne. However, the King did not get on with his eldest son, Carlos, and having stripped him of his rights to the Kingdom of Navarre, Juana feared for the life of her unborn child. Seeking sanctuary in Sos del Rey Catolico, she entering the town through the Jewish gate, and was taken to the Sada Palace where she gave birth to Ferdinand II. The bitter conflict between the King and Carlos continued for some time, but eventually came to an abrupt end when Carlos mysteriously died. It was suspected he had been poisoned. The second story relates to the persecution of the Jews. Thirty houses enclose the Plaza de la Sarten, now called Barrios Nuevo, which was the site of the old Jewish Quarter. During the reign of King Ferdinand and Queen Isabella, all the Jews of Spain were ordered to either convert to Christianity or be forced to leave the country. Some of the Jews in Sos chose to ‘pretend’ they had converted, and often appeared to be more Christian than the Christians themselves by carving crosses into the exterior wall of their homes as a sign of their devotion. Unfortunately, it is not that easy to spot these particular homes, but there are many good walking tours available which will point them out. The Church of San Esteban is the main church in Sos, and one of the oldest and most interesting monuments in town. Accessed through a Romanesque portal is the cell where King Ferdinand II was actually baptised, and if you look inside the crypt of Santa Maria del Perdon you will also find some 14th century murals. In the Plaza de la Villa is the Town Hall with its upper story arches and wooden eaves. The Romanesque Chapel of Santa Lucia is another interesting building which dates back to the early 13th century. As mentioned earlier, King Ferninand II was born in the Sada Palace. This is now a museum with various displays of coins, shields, armour, and precious documents. There is also an audiovisual display about the history of the town over in the last millennium. In other words there is simply an abundance of interesting places to explore while you are there. Not far from Sos del Rey Catolico is the Monastery of San Salvador of Leyre which is located in northern Navarre. It is one of the most historical monasteries in Spain with records that date as far back as 842AD. There is also the town of Uncastillo which is less than half an hour away, and if you climb the rock of Ayllon you will get a wonderful view of Uncastillo’s unique skyline of church steeples and towers. But for those who are in the mood for something a bit more active, the Sierras of Santo Domingo and Yesa Dam offer sailing and swimming, or there is hunting and paragliding in the valley of Anso and Hecho. This historical town and the surrounding area has so much to offer you will not want to be sure to give yourself enough time to take it all in, especially during the months of July and August when various festivals are held over the weekends. 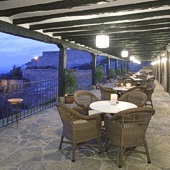 If you are looking for a hotel to compliment your stay then consider the Parador (Hotel Fernando de Aragon). It is a luxury hotel built in traditional Aragon style with beautiful views of the Pyrenees and perfectly situated as it is within easy reach of the medieval part of town.